Like many TAS episodes, "The Practical Joker" is rushed with some plot holes. Most of the jokes are not even very funny. Worst of all, the ship creates itself an inflatable Enterprise of equal size. What the heck? Why would the Enterprise be equipped with an inflatable fake in the first place? Did the computer create it? If so, how? It all seems too silly to me. 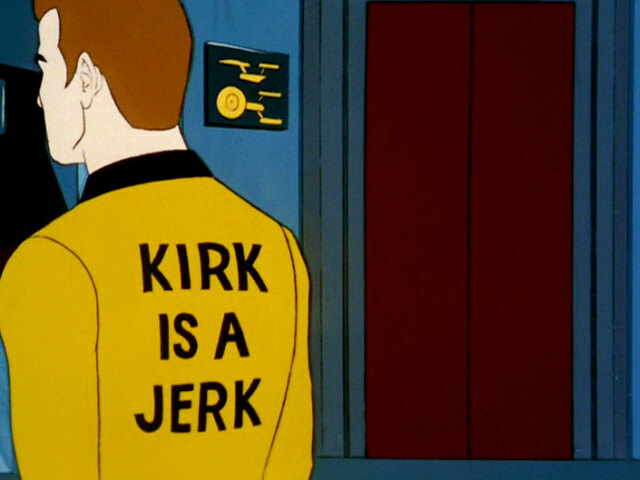 Remarkable prank: Kirk has a new shirt made for himself and the computer prints on the back of it "Kirk is a Jerk". Probably the only funny joke of the episode. Remarkable technology: The rec room. Could it be that Starfleet already had holodecks on some of their ships? This would not work well with TNG where is is assumed that holodecks are a fairly new technology. However, since this series is animated (and poorly at that) we could assume that the rec room is not as realistic as a holodeck from the 24th century. If this were the case, then Riker's comment about being astonished by the perfection of the holodeck would make sense. Also, in "The Practical Joker" the team decides to try and find a wall since the room is only so big. This trick would not work in the many holodeck malfunctions of the TNG era. Remarkable voice: Majel Barrett seems to provide the voice for the ships computer. Majel would later do the voice for Starfleet ship computers in the TNG era.